Roof repair isn’t something you want to mess around with. If you have experienced storm damage, or discovered a leak, a crack, missing shingles or anything else, you want a team who is going to come in and handle it quickly, without ripping you off. We are the company who will get it fixed properly, quickly and fairly. We excel in residential roofing services because we understand how important it is to keep your roof in good shape; after all, it is the only thing standing between your home and Mother Nature. A leaky roof can quickly turn into major damage for your home or business, and we take it seriously. 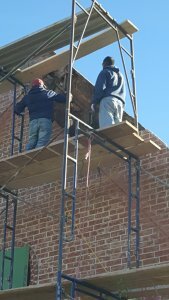 Our roofers will find the cause of the problem and get it resolved as quickly as possible. Call us today to get an appointment scheduled; or if you need urgent roof repair, you can call us any hour, any day. If your roof has suffered from storm damage or hail damage, we also offer free inspections that can qualify you for insurance claims to cover the necessary repairs. If you’re having difficulties with your residential roofing, contact one of our contractors right away to find out what could be the cause, and how we can help you proof your home against such problems in the future. Leaky roofs – if you’ve noticed a leak, alert us right away. Leaks in roofs are quick to spread and can deteriorate the structure rapidly. Don’t take any chances, call us! Missing shingles – normal wear and tear or bad weather can sometimes take its toll on your shingle roof, but the quicker you get those shingles repaired or replaced, the better off your roof is. You don’t want to let the elements seep into the underlayment of your roof that’s now open to the skies, call us to get it patched up fast. Storm damaged roof – if you’ve experienced heavy wind or rain and need an inspection or repairs to your roof, call us. We can even fill out the insurance claim paperwork if your roof has been damaged. Hail damaged roof – these take shape in a number of forms, depending on your roof type, and should be addressed rapidly, as the longer you wait, the harder it can be to spot the damage and get your insurance claim filed for it. None of these are a good sign, and we can help you determine what damage has been done, and prevent further damage with quick roof repair by proficient roofers. If you need commercial roof repair due to any of the above factors, don’t hesitate to call us. We are proficient with all commercial roofing materials such as Durolast, modified bitumen and EPDM and will be able to handle the problem you’re having. We handle roof repair in Bentonville, Springdale, Fayetteville, and all of the nearby areas.